Toma una góndola por el Gran Canal y admira la ciudad. Escuche el comentario informativo de la historia de Venecia de su guía. -The guide in St. Marks was very knowledgeable, professional, and friendly. 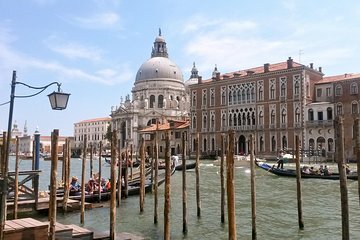 -The gondola ride is a perk to inexpensively get that out of the way, if you will. 1 Gondola ride was too crowded. I literally didn't have a place to sit and had to sit on the step in the front. I looked around at other boats with similar load outs and they at least had a cushion. Not me! 2 St. Marks square was an absolute disaster, but it wasn't entirely anyone's fault. You see the Italian government likes to just change things, and what was changed this time was the skip the line aspect. Everyone was forced to go to the common line. However, our guide who by the way was fantastic as mentioned in the pro's section learned that this was changed a few days prior to our arrival. Therefore, the organizers could have warned people via email. Instead, I feel the experience was falsely represented. This overbooking, along with poor time planning since the organizers did not check into the skip the line issue, resulted in numerous problems. First, the headphones used by the tour guide in the museum do not work well if the tour guide is entering into another room and you're not quite there. Normally, this is fine because the group is smaller and you can quickly get to the other room. However, due to the large group size, you had to fight to be at the front or else spend quite a bit of time in the previous room, unable to hear anything. Second, due to spending way too much time waiting in line we should have arrived earlier and had literally hours in-between the gondola tour and the museum to do so, but the organizers failed to plan, we had to rush through the end and essentially skip the prisons and other cool parts because most people not us though had to get onto the next part of the tour which was a boat ride. I would not recommend this tour.